Growing up, the idea of bringing a TV outside was something we had always wanted but were never allowed to do. Now that we find ourselves in the positions of our parents, it’s easy to understand why: TVs just aren’t meant to be outside ... unless, of course, they’re specifically designed to be there. That’s more or less the M.O. for SunBriteTV, a maker of all-weather LED-LCD TVs that’s based in Thousand Oaks, California. They design TVs to withstand the elements and last outdoors all year long. It’s an interesting premise, certainly, and one that proves to be useful in more situations than you might expect. We’ll cover what it’s like to buy one in the section below, but first let’s talk about how SunBriteTV’s series stack up. 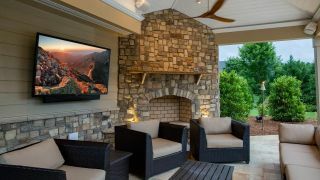 The most important thing to know is that SunBriteTV offers three series - Veranda, Signature and Pro - that correspond to where the TV is going to sit on your outdoor patio, deck or mounted to the side of your house. Rather than create a good, better and best series like other manufacturers, SunBrite’s lineup starts with the full shade Veranda Series. This is the kind of TV that still sits outside, but should ideally be in the shade most of the time. According to SunBrite, the Veranda Series is about 50% brighter than your run-of-the-mill LED-LCD from Samsung, LG or Sony, but that’s still not bright enough to resist the dulling effects or glare that occur when a TV sits in direct sunlight. In terms of resolution, all models the Veranda series supports 4K while the 55-inch model supports both 4K and HDR. The series comes in four screen sizes (43-, 55-, 65- and 75-inches) all of which are cheaper than an equivalent sized screen in the Signature or Pro series. Like the other series, the Veranda Series includes a weatherproof remote and weatherproof bay for a streaming player like the Roku Premiere, Chromecast or Amazon Fire TV Stick. SunBriteTV’s Signature Series serves a slightly different purpose: it’s designed to sit in places that fluctuate between full sun and full shade, ideally in a spot that’s partially sunny in the times that you’d be outside watching TV. Unlike the Veranda Series, none of SunBrite’s Signature Series have HDR - an important consideration if you’re a cinephile - but, that said, the Signature Series is brighter than the Veranda Series and up to three times as bright as traditional LED-LCD screens from Samsung, Sony and LG. The trade-off here is that the Signature Series is more expensive: the 43-inch model starts at $2,799 and the 65-inch model will set you back nearly $8,000. Last but not least is the SunBriteTV Pro Series, which, oddly enough, doesn’t feature 4K at all. How it gets its Pro name isn’t necessarily based on the picture quality, but rather, because it features an impact-resistant glass screen. Like the Signature Series, the Pro Series is outstandingly bright (around 1,000 nits according to SunBrite) and ready for whatever the outdoors has to throw at it. It’s designed to sit in direct sunlight areas and is UV-resistant so performance won’t diminish over time. In terms of audio quality, while the two other series use 20-watt down-firing speakers, the Pro Series ups the ante to a separate, detachable speaker bar. The Pro Series comes in four screen sizes from 32- up to 55-inches and range in price from $3,295 on the low-end to almost $6,000 on the 55-inch SB-5518HD. Should I buy a SunBriteTV? If you frequently host soirees, own a hot tub where you want some extra entertainment or plan on spending a time outside during warm summer nights, a SunBriteTV is pretty much the only brand of TVs we’d recommend. In fact, even in relatively enclosed spaces that are still subject to excessive moisture or heat, we’d recommend a SunBriteTV as well. This might be a downstairs basement, partially enclosed sun room or garage, all of which would benefit from a little extra protection in case temperatures fluctuate. If there are drawbacks to the SunBriteTV lineup it’s that AV enthusiasts might be nonplussed by the omission of HDR in all but one of the models, and budget buyers probably won’t be able to afford much more than the 32- or 43-inch TV. At around $6,000 and up, it’s prohibitively expensive to buy anything bigger than 55-inch screen unless you’re looking to outfit a business or decorate a high-end property for a sale. SunBriteTV’s biggest selling point is the peace of mind you get by buying a TV that was designed for the outdoors. You’ll know that it can resist the elements (SunBriteTV claims they'll work at temperatures from -40 F up to 122 degrees), and was designed to be bright enough to overcome direct sunlight and glare - two things that indoor TVs were just never designed to do. That comes at a price, obviously, but for those willing to pay a bit more, it’s one that feels justified.